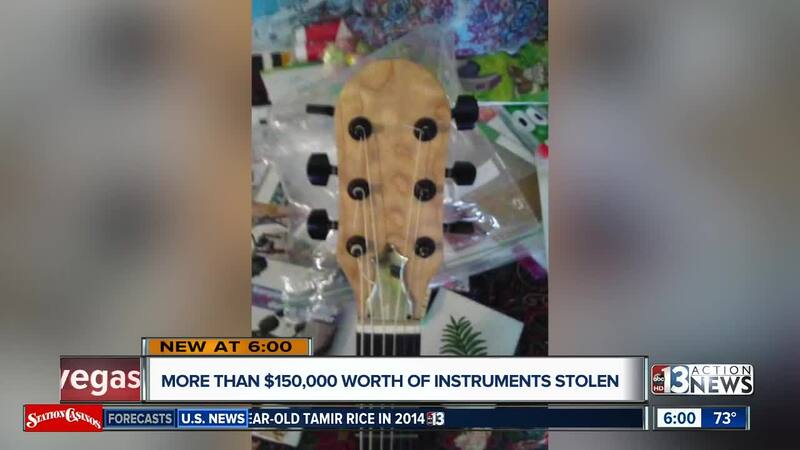 Thousands of dollars worth of custom-made musical instruments were stolen from a workshop overnight, and the craftsman is hoping someone will be able to recognize the instruments. A shattered window and a wall of empty racks is what's left inside Fidelity Concepts Instruments near Arville Street and Flamingo Road. “The shop had been turned upside down,” says Doug Housley, owner. Housley says the crooks made off with 14 guitars, three violins and one viola. All of the instruments were custom made, ringing up at a total price of $150,000. Making matters even worse, the owner was preparing to open up his own display store at New Orleans Square, but now he's having to start from scratch. Other employees at the shop say they are heartbroken that someone would do this. “These are handmade instruments that are individual and special and irreplaceable,” says Alexander Zmyewski. The shop also had a security camera installed, but the crooks stole that as well. Housley hopes someone will recognize these unique instruments before they're gone for good. “The important thing is to get my inventory back,” says Housley.